Miami, FL, U.S. – (February 6, 2019) 1791 Gunleather®, innovative manufacturer of premium hand-crafted leather and Kydex® gun holsters, has significantly expanded its U.S. sales network with the addition United Sporting Companies (USC) as their premier wholesale partner. Currently stocking 1791 Gunleather holsters and belts, USC offers dealers the opportunity to purchase from one of the largest product selections available in the hunting and shooting industry. 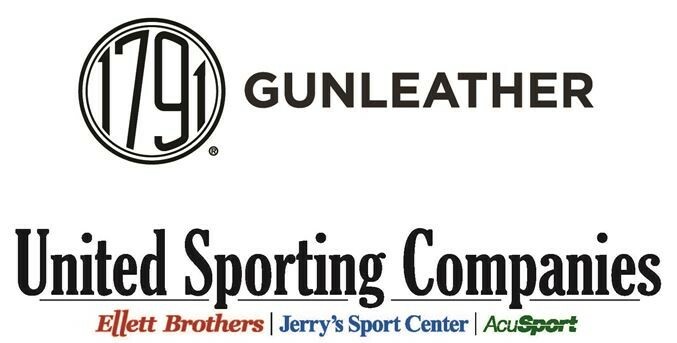 “United Sporting Companies has earned a stellar reputation by providing unsurpassed service to retailers and suppliers,” said 1791 Gunleather CEO, Ramiro M. Romani. “Across the industry, they’re known for their top-notch sales reps and management team. As demand for our top-quality holsters continues to grow, this relationship will allow each of us to expand our market share while at the same time deliver the highest quality products and services to our valued retail partners,” he added. The full 1791 Gunleather assortment is currently available through USC including the new for 2019 Project StealthOWB holsters that combine certified American Heavy Native Steerhide with flexible, woven carbon fiber. In addition, the newest 1791 Tactical IWB Kydex holsters are also on hand. To set up a new account with United Sporting Companies, phone 1-800-234-2612 ext. 2222, or emailnewaccounts@ellett.com. For more information about stocking 1791 Gunleather, please contact 1791 Gunleather National Sales Director, Janette Palmer at janette@1791gunleather.com. For further details on 1791 Gunleather visit www.1791gunleather.com. This entry was posted in Holsters and tagged Gunleather, United Sporting Companies, USC. Bookmark the permalink.